Marissa Bartmann remembers going to 4-H meetings in Windsor for her brother when she was a little girl. She was just a Cloverbud, the youngest of the 4-H members, back then. Seeing the Weld County Fair, Bartmann was hooked. She knew she wanted to be part of it. She wanted to ride horses. “Mom said, ‘you’re not old enough yet, you have to wait another year,’” said Bartmann, 23. For Bartmann, 4-H is part of her life’s rhythm. Even though she’s stepped back in the last couple years, she’s in tune with the calendar. She knows when fair time comes around. She knows where animals should be. Preparing for the Weld County Fair all those years helped shape Bartmann into the woman she is now, and her accomplishments in agriculture are why this year, she was named the fair’s Shining Star. It’s a recognition the fair board gives to one outstanding former Weld County 4-H or FFA member who competed at the fair, then went on to outstanding things, said Janet Konkel, fair coordinator. 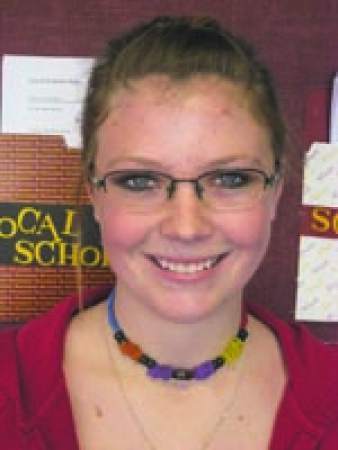 Bartmann, who was in 4-H for 10 years, is the second recipient of the Shining Star award. Horses were always Bartmann’s biggest passion, even before she was old enough to show animals. Riding was a way to escape. She also showed goats and dairy cattle. When she graduated high school, Bartmann made a point to come back and help with the Weld County Fair. She spent the summer of 2014 as the Weld County Livestock Coordinator Intern. For Bartmann, the behind-the-scenes action was an eye opening experience. As a 4-H member, she knew a lot of work went into the process, but she had no idea how much. Bartmann loved 4-H for the opportunities it gave her — from getting to know her animals to learning the importance of record keeping. But times change. Last year, Bartmann wasn’t as involved in 4-H. She was busy finishing her master’s degree in agriculture at New Mexico State University. Bartmann was selected as an International 4-H Youth Exchange, or IFYE, representative, a program through 4-H that allows participants to travel overseas to learn about different cultures. She will stay with host families and learn about how they live. Her interest is in agricultural families in different areas throughout Europe, including Scotland, Northern Ireland, England and Wales. After that, Bartmann knows she wants to get into agriculture — where specifically, she isn’t yet sure. While she was in school, Bartmann learned about wineries. She took a semester-long course on making wine. The process of making it from start to end caught Bartmann’s attention. That’s a path she’s considering. For now, Bartmann follows 4-H news and keeps up on what’s going on with the program. It will forever remain a force that molded her life. — The Fence Post Editor Nikki Work contributed to this report.